I'm so thankful that Ryan went to the meetup with me, even though he was still tired from our weekend trip. Once we got home it was time to start dinner. I haven't had a chance to go grocery shopping in a while so our dinner was a mess of whatever I could find in the pantry and freezer. The picture doesn't do the meal justice ... it was actually really good. 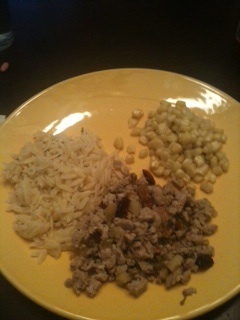 I made some orzo, corn, and some ground turkey. The ground turkey was dressed up with fresh chopped sage, minced onion and garlic, a chopped apple, some dried cranberries, and some golden raisins. I told Ryan it reminded me of thanksgiving ... probably from the fresh sage.